Moving boxes are among the very first things you should prepare when you decide to move house. In order to make your relocation more affordable, you should find out where you can get cheap or free of charge moving boxes in New York City. There’s a variety of moving boxes that are just one phone call away. Contact the New York City moving company that seems most suitable and find out more about what they have to offer. Bare in mind that plain cardboard moving boxes can be found anywhere. Friends or relatives who have moved house recently probably have some spare moving boxes. Also, you can visit local furniture stores, restaurants, book stores and arrange with the managers when you can collect the moving boxes. They usually have large, sturdy boxes that you can put to good use. If you are looking for some green materials for your move, you can contact your moving company and find out how to make your move more eco-friendly. 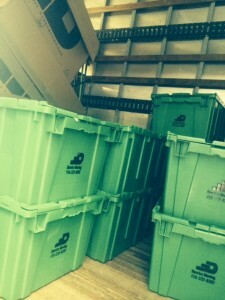 Dumbo moving and storage has to offer environmentally friendly green bins. The moving company representatives deliver the boxes at agreed time and then pick them up after the move is completed. Furthermore, NYC movers can do all the packing and unpacking for you. Knowing which type and size of boxes to use for which items is a great advantage when it comes to arranging your household items for the upcoming move. We offer a variety of them. So if you want moving boxes in the NYC area, come by our office and we will be happy to sell some to you. Are you familiar with the wardrobe moving boxes – special containers designed for packing and moving your clothes? Wardrobe boxes are used for transporting hanging clothes from one place to another. 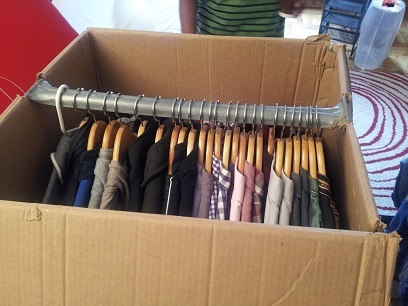 Since wardrobe boxes are equipped with a metal bar, you can just move your clothes from the closet to the box and hung them. As a result, your clothes won’t get wrinkled during the move, therefore you can just put them back into your new closet without doing the ironing. However, before you start packing, think about whether you really need to move everything you own. Leaving behind some personal items can be really hard, but there’s no point in moving some old clothes that you are not going to wear at all. In fact, you can put them to good use by giving them to charities. The amount of your clothes will determine the number and size of moving boxes that you need. So, in order to reduce the effort and moving costs make sure you purge your closet and give away everything you don’t need any more. Wardrobe moving boxes have this lovely bar on the top so that you can hang all your hanged clothes up on the bar. So do not worry about packing up your elegant dresses or coats. We will scoop those up and pack them for you. Specialized wardrobe boxes are just one phone call away. In order to make your move more environmentally friendly you can opt for renting plastic moving containers which are reusable. Professional moving companies in New York City usually offer various types of plastic moving boxes. Once you get in touch with the NYC moving company and make all necessary arrangements, moving representative will deliver moving bins and then pick them up once the move is completed. 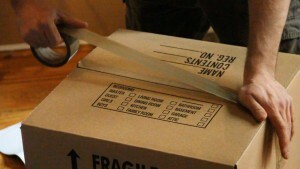 Plastic containers are very practical and convenient for moving delicate and fragile items. Furthermore, your NYC movers will handle them easily since they are stackable and fit perfectly together. One of the advantages of using plastic moving bins is that they do not generate additional waste. -Mark your moving boxes on the sides, not the top or bottom because if you stack other moving boxes on top of each other, you will not know what room they belong to. An efficient labeling system will help you keep track of all your belongings at any point of the move. -If you need some extra moving boxes and you are not willing to purchase them, check out big grocery stores around midtown or hardware stores. They usually have extra cardboard boxes they are willing to give away. -Donate or use up all the food from your refrigerator before your move. Food is not allowed in the moving truck. In fact, it’s one of the non-allowables, so make sure you are familiar with all the items your movers will refuse to load onto the moving truck. – Do not overpack the boxes. It’s much faster and safer to move two smaller and lighter boxes than one big and heavy. -To save time, instead of emptying removable drawers, you can remove the entire drawer and wrap it with the plastic wrap, which will keep the content of the drawer in place. – Protective material like padding, bubble wrap, cushioning material is highly recommended. Alternatively, old towels, blankets or clothes may serve the purpose. Standing among the piles of used moving boxes and other moving supplies is not a pleasant picture at all, especially if you are not sure as to what to do with all that moving material. In order to attribute to our planet’s well-being you can choose to act more environmentally friendly even after the move is completed. Used packing materials and cardboard boxes create a lot of waste. Some boxes can be reused for storage or shipping purposes, while others should be disposed of properly. If you are interested in making some money, you can sell moving boxes that are in good shape. A green alternative would be to contact your local recycling center and check their regulations and schedule. Instead of throwing the boxes away, give them to a friend who is planning to move house soon. Also, your moving company can give you a piece of advice and a couple of green ideas in terms of how to proceed and what to do with used moving boxes in New York City. Cardboard moving boxes or plastic containers? What type of moving boxes do you need?